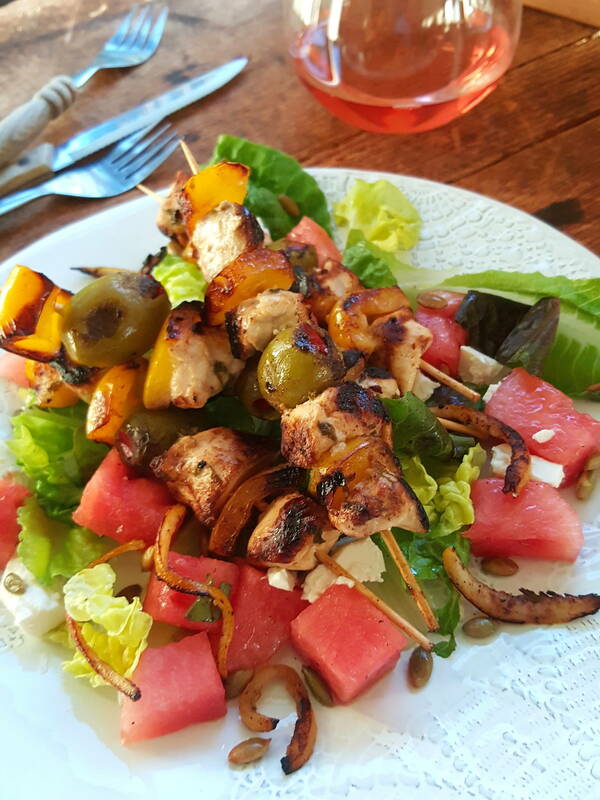 Chicken skewers on watermelon, feta salad – a taste of summer! Fresh and juicy, with a salty lick of feta, this dish is perfect for lunch on a hot summer’s day, or for a shared platter with friends on a balmy evening. 1 Core and deseed peppers and cut them into smallish chunks. Put in a bowl and mix in one tablespoon of olive oil. Set aside for 15 minutes. 2 Peel off lemon in long thin strips and juice the lemon. Put rind in a bowl with strained lemon juice and honey (if the honey is stiff put it in a ramekin set in a bowl of hot water until melted), the rest of the oil, mint, ½ teaspoon of salt and pepper to taste. Mix well, then add chicken pieces, stirring well to coat. Thread chicken onto bamboo skewers alternating with chunks of yellow pepper and olives (be a bit random, some with one olive, some with two …). 3 Cook chicken skewers over a medium heat on a preheated and lightly oiled barbecue hot plate (griddle) until chicken is lightly browned and cooked through; do not have the heat too high or the outside of the chicken will darken before the inside cooks properly. Drizzle with marinade during cooking, but take care the pieces of lemon rind do not burn. Scrape them onto the hot plate and cook them separately until golden, then put them on top of the skewers once they are cooked (they have a delicious intense lemony flavour). 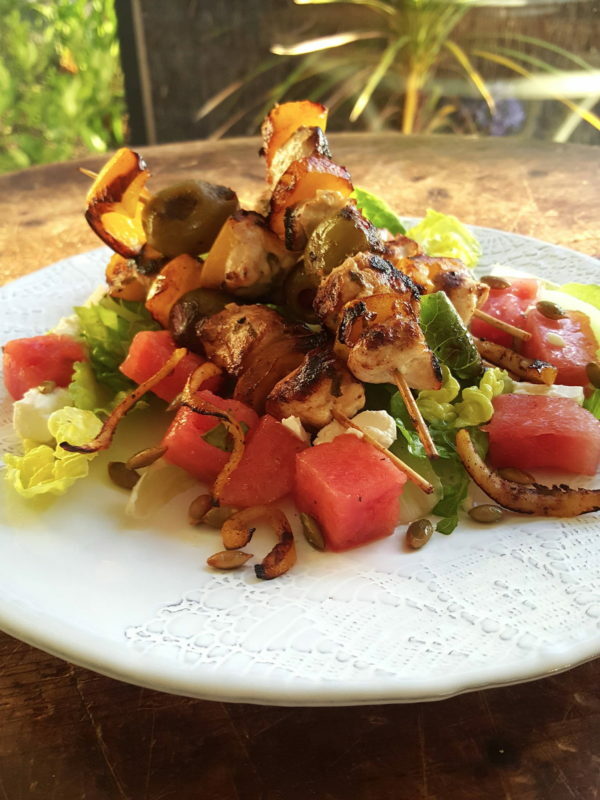 Alternatively, cook chicken skewers in batches in a preheated lightly oiled ridged grill pan. 4 Have ready a salad made with remaining ingredients. Cook the pumpkin seeds first in a lightly oiled pan over a medium heat until they cease popping, shaking pan occasionally (the pan must be covered either with a splatter screen or a lid, because seeds pop everywhere and they’re hot!). Tip seeds onto a plate and sprinkle generously with sea salt. 5 Arrange cos leaves on a large platter. Lay watermelon slices on leaves, crumble feta over, then scatter over pumpkin seeds. Mix lemon-infused olive oil and white wine vinegar with a ½ teaspoon of sea salt and some black pepper. Pour this over the salad. Put the hot chicken kebabs on top and garnish with mint. Serve immediately. Colourful, crunchy, salty, juicy … mmm! And they cant wait to try this recipe! Excellent! I hope they scoff it up appreciatively Marguerite. Lots of gorgeous flavour in this dish. Freekeh freak-out! Traffic light bright!